In April 2016 we played the final concert of our tour of England with a wonderful night at West London Synagogue, the oldest synagogue affiliated with the Movement for Reform Judaism and is one of the oldest synagogues in the United Kingdom. It was a spectacular concert with a very special atmosphere and we are delighted to be invited back this year for what is more than likely to be the only significant concert by The Berakah Players ensemble in London this year. The Sing for Peace Choir and our Increase The Peace youth band perform regularly throughout the year but The Berakah Players concerts are a somewhat more rarified event so if you’ve missed us on the last tour please put this date in your diary and take advantage of the early bird ticket prices. In April 2016, The Berakah Players made its unforgettable West London Synagogue debut performance, filling the stunning Italian-Moorish synagogue with the band’s intoxicating fusion of classical, jazz, gospel and world music. 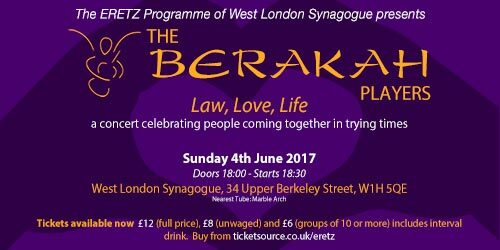 The Berakah Players’ much-anticipated return in Law, Love, Life takes its Inspiration from the Jewish Festival of Shavuot, when Jews around the world celebrate the giving of the Ten Commandments on Mount Sinai – so important to all three Abrahamic Faiths. Join people of all faiths and none, coming together in harmony and celebrating in joyous and uplifting music. opportunity to create harmony in more ways than one’ – Helen Freeman, Principal Rabbi of West London Synagogue. £12 (full price), £8 (unwaged) and £6 (groups of 10 or more) includes interval drink. Admission: £12 (full price), £8 (unwaged) and £6 (groups of 10 or more) includes interval drink.